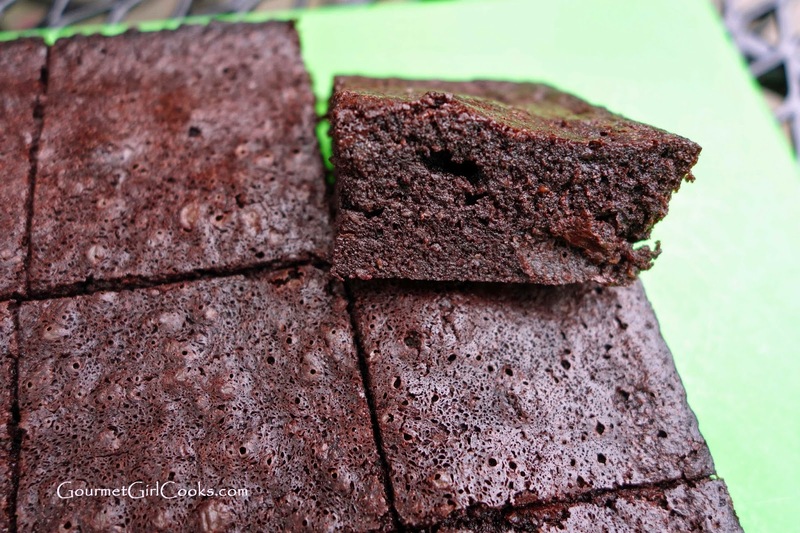 Today I'm posting the recipe for my Bulletproof Fudgy Brownies! This is the tweaked batch that I made the other day. They turned out great...nice and fudgy which is what I was aiming for. The first batch I made was more solid, dense and dry but worked out great as an add-in for ice cream or frozen yogurt and they also made great cookie bases for ice cream sandwiches or frozen whoopie pies! Even after reducing the cocoa powder in these, they still turned out nice deep, dark and chocolatey. I used a more intense cocoa powder made by Valrhona, but you can use any brand you like. I baked my brownies for exactly 32 minutes until the toothpick inserted in the center came out clean except for one little moist crumb on it, but depending on your oven, they take 30 to 35 minutes. Why are these brownies bulletproof you ask? Well, with all the chatter about bulletproof coffee (essentially coffee that folks add butter and/or oil too)...I thought that these might be a tasty dessert version (after all, they do contain espresso powder). Seriously though...these brownies are dairy free since they use coconut oil instead of butter (and no, there is no coconut flavor). They also have espresso powder added (and no, they don't taste like coffee). The espresso powder just deepens the chocolate flavor which is always a good thing! 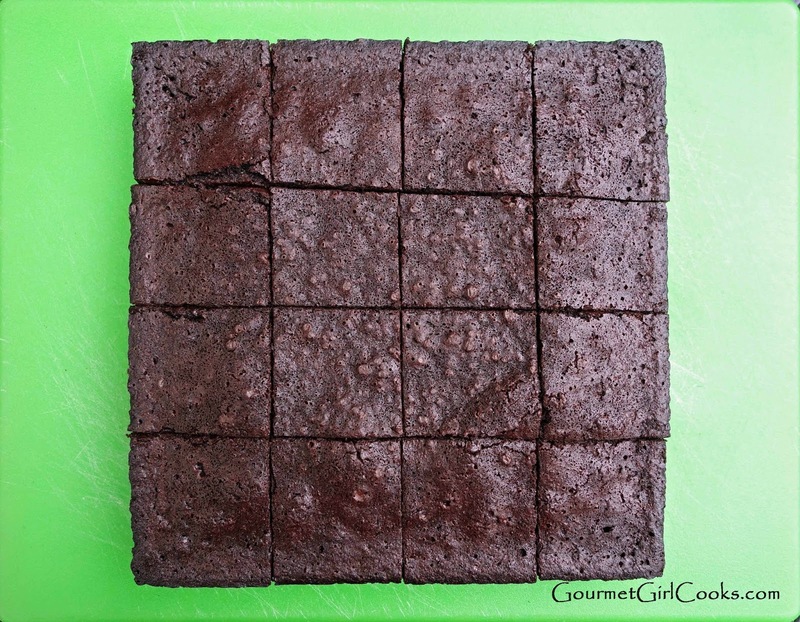 If you like your brownies a little sweet, you will probably prefer using the full 1-1/4 cups of powdered Swerve or sweetener. I only used 1 cup because I lost my super sweet tooth after more than 2 years without sugar. I pushed these over the edge a bit by adding some dark chocolate chunks which I made very simply by chopping half of one of my 3-ounce bars of Endangered Forest 88% chocolate. You can use your favorite or omit them altogether. You can also swap the coconut oil out for butter if you prefer. I just thought that these would be a great way to enjoy a favorite chocolate dessert and get a little dose of healthy coconut oil at the same time...and for those who have issues with dairy, these would be good for you too! I used Honeyville's new hazelnut flour in these instead of almond flour. It worked beautifully. These would be great with some toasted hazelnuts stirred in. I'll do that next time I have some hazelnuts on hand. I snapped a few photos below. I hope you like these as much as I do. Enjoy! Preheat oven to 325 degrees F. Lightly spray or grease an 8" x 8" square baking pan. In a large microwave safe bowl, combine coconut oil, cocoa powder, espresso powder, powdered sweetener and salt. Microwave approximately 1 to 1-1/2 minutes on high, stirring every 30 seconds or so until slightly heated and smooth (as an alternative to using a microwave you can heat mixture using a double boiler over the stove until heated and smooth). Stir in stevia and vanilla. Add eggs one at a time, beating briskly after each egg. After adding all eggs, beat well until batter is glossy and smooth. Stir in flour until blended evenly. Fold in chocolate chunks. Spread batter evenly in prepared pan using a rubber spatula. Bake for 30 to 35 minutes or until a toothpick inserted in center comes out mostly clean. Let cool completely in pan before cutting. Makes 16 brownies. *Note: Butter can be substituted for the coconut oil if preferred (the coconut oil does not give a coconut flavor to the brownies). Brownies may appear very slightly wet on top when removing from oven but will disappear within a couple of minutes. 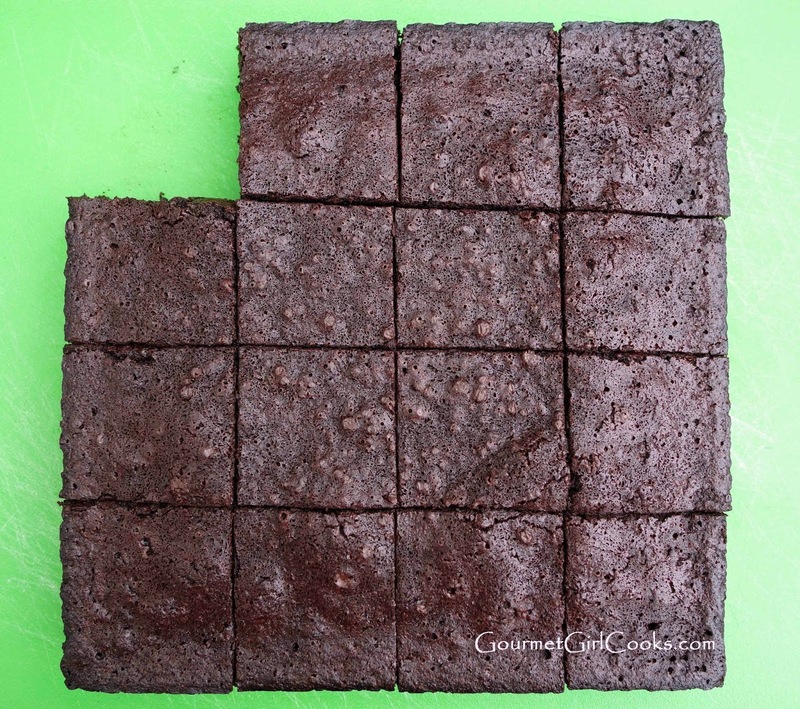 Be careful not to overcook brownies to maintain their fudgy texture. Also, almond flour can be substituted for hazelnut flour. *Tip: To use this recipe to make a denser dark chocolate base for ice cream sandwiches, frozen whoopie pies or for add-ins for frozen yogurt or ice cream, add 1 tablespoon coconut flour to your dry ingredients and bump the cocoa powder up to 3/4 cup instead of 1/2 cup. I do not have hazelnut flour. Could I use Honeyville almond flour? 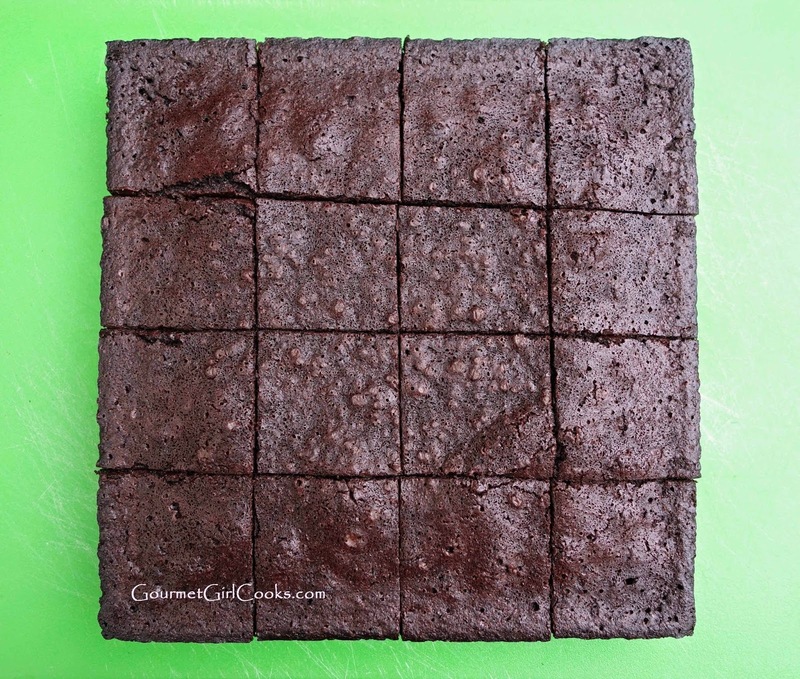 How many carbs are in one brownie? About 2 net carbs each. I have some Bob's Red Mill hazelnut flour and wondered how that compares to Honeyville. If Honeyville's is super fine (like their almond flour) maybe I could run Bob's through the Magic Bullet. They come in semi-sweet and dark varieties. The *dark* ones contain 69% cacao. I think the flavor is very nice. Normally I'd chop up a somewhat higher percentage dark chocolate bar (and make a mess in the process) but these are just so darn convenient to pour out of the bag ... and they are only 1% shy of 70%. :-) The "dark" ones have only two ingredients, unsweetened chocolate and that little bit of sugar. They're *certified* gluten-free and non-GMO, too. Why would these by classed as low carb please? The link for the espresso powder links to the cocoa powder... which espresso powder do you recommend/use? I've fixed the link. Check your local grocery store first before ordering it. Many stores carry it! Thanks! I think Bob's Hazelnut flour would work just fine without any further blending. I didn't find the Honeyville hazelnut super fine like their almond flour and it has skins in it too. I haven't tried the Enjoy Life morsels yet but would definitely like to have them on hand. Like you said...much less mess and they are ready to go when you need them. Do you find them at Whole Foods? YAY! I've seen some other almond flour brownie recipes, but I appreciate how your recipes tend to not have too many unfamiliar items in them. This looks quite tasty. Judging by the number of comments, you can tell what we all like best, ha ha! Just wondered how you decided to use hazelnut flour? And do you think I could grind hazelnuts and use "meal"? I will have to get some espresso powder and make these soon! Sweet Baby Jesus this is the most decadent handful of deliciousness EVER. My kids and I are fighting over these...yes I WILL fight a kid for these brownies. ;) So I made them with Bob's Red Mill Hazelnut Flour and butter instead of coconut oil and they are amazing. I will be so depressed when these are gone....until I make more. :) You've done it again GGC. I am curious as to why you use two different types of sweetener.... the Swerve and the liquid stevia. LOL...you made me giggle when you said you were fighting the kids for these! Too funny! I am so happy that you and your kids enjoyed these. My 2 grown sons came for dinner last night and saw them on the counter (they aren't grain or sugar free)...and both of them told me they were as good or better than regular brownies...and one conceded they were better than regular! How great is that! I have some granulated stevia, how would I substitute that for the liquid stevia? As well, I bought a bag of erythritol from Honeyville, how does it compare to Swerve? I have been very intrested in buying some of the powdered sugar type swerve, but it's always out of stock, hoping that will change--very soon! Thanks for your expertise, I'm excited to try these! Can't wait to try these, but I'm not familiar with Swerve. I can't have artificial sugars and was wondering if regular stevia could be used instead of the swerve, and if so, would you still have to put in the liquid stevia? Thanks! May I use coconut flour instead of hazelnut flower? i'm still trying to find espresso powder. called natural foods mkt…nope. even went to starbucks..nope. happened upon some at marshalls (of all places) and snapped it up, not realizing until i got home that it was not instant. the search continues….hazelnut flour has arrived and i've got everything else ready to go. I made the brownies a couple of days ago and they're *wonderful*! My hubby likes them, too! Bob's hazelnut flour worked great. Next time I might add some walnut pieces, like Mom's. :-) They're just a bit more sweet than we're accustomed to, so next time I think I'll try omitting the stevia. This is a "keeper" for sure. Tomorrow I plan to make the vanilla frozen yogurt to go with the rest of the brownies ... I picked up the Greek Gods today. BTW, I had no trouble finding Medaglia D'oro instant espresso powder at the regular grocery store. Looks gorgeous!! Espresso powder is the only thing I'm missing - could the recipe possibly go without? 1:30am and i'm waiting for brownies to cool so i can remove from pan and go to bed LOL! won't be testing them tonight because of espresso, besides i want to make the frozen yogurt tomorrow. they look a bit overcooked altho i have oven thermometer and removed after 30mins. will report back after tasting. tested brownies today. they were overcooked/very dense…not fudgey at all, more like crispy cookies…but worked fine in the frozen yogurt i made today..yummmm!! next time i will experiment w/adjusting sweetener…too much stevia taste for me. i put about 1tsp in yogurt…next time i think i will omit it altogether. Finally tried this recipe--2 thumbs up! I also discovered a healthy version of "ice cream cake" by crumbling the brownies in the bottom of a greased pan, then adding homemade frozen yogurt, a few sliced berries & whipped heavy cream for the topping! yum! And how is Spike doing now? 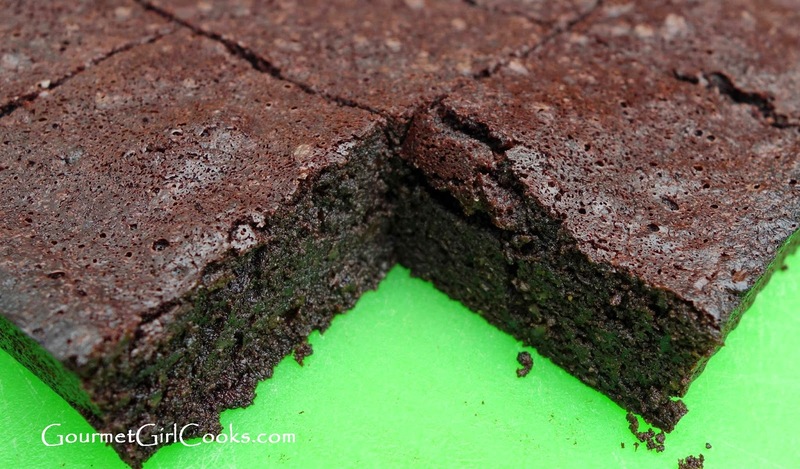 This is, by far, the best low carb brownie recipe I have ever tried. Thank you, thank you, thank you! All your recipes are fantastic. My faves: Brownies, biscuits and spinach pie. All delish! Just happen to have some Honeyville hazelnut flour on hand, yay! Do these taste a lot like hazelnut, or is it more like almond flour - strangely neutral? Oh, awesome! Good to know. I love hazelnut flavor, but honestly it's nice to have another neutral low carb nut flour. One more question, probably a little silly - but I'm thinking I want to make a bit of a brownie layer cake with this recipe. Do you think this amount of batter could work with two 6" circle pans? OMG, I just made these and, well, OMG! Incredibly deep chocolate flavor (I used some chopped 85% chocolate as suggested) and super fudgy texture. My daughter thought they were "bitter"...I thought they were perfect. Definitely going to serve with some lightly sweetened whipped cream! I used half butter, half coconut oil, and a packet of Starbuck's VIA instant coffee, which was all I had on hand. A nice substitute if you don't want to invest in a jar of instant espresso. I just want to say I use decar espresso powder in recipes that call for espresso powder and it works just as well and doesn't give me that caffeine jolt. I'll be making this recipe today -- can't wait! I did end up making a 6" round two-layer birthday cake with this recipe - it turned out fabulously. Rich and fudgy and dark chocolately. I filled it with a chocolate ganache and topped with some sugar-free vanilla buttercream, and I could hardly deal with how awesome it was. Thank you SO much for this recipe! I'd love to send you a picture, but I'm sure you get so many emails a day, I didn't want to spam. I can highly recommend it now! One thing, though - I noticed Honeyville's hazelnut flour doesn't seem to be as finely ground as their almond flour. For this recipe I actually sifted a good bit of it to get out the heftier chunks. Do you notice this with yours, too, or maybe I just got a weird batch? I agree and do believe the hazelnut flour is a more coarse grind, but I didn't notice any difference with the brownie or another cookie recipe I made with it. Maybe if you were looking to make a lighter cake type of recipe, sifting it would probably be best. This recipe is so delicious. They can be varied so many ways. So far, I've made them plain or with nuts, but my favorite is to bake them in my mini-muffin pans with a scoop (1/2 tablespoon) of natural peanut butter plopped in the middle. I've received rave reviews on these at work, too. No one can believe that they are low carb. Back again to comment on how fantastic this recipe is, but with some questions too! 1. Do you think this could be converted to a blondie recipe? 2. If so, what changes do you think you'd make (other than just removing the cocoa powder)? 3. Do you think it'd have the same dense, chewy/fudgey texture? I'm not sure if it would work. It would need a number of changes and tweaks. I had blondies on my "to do list" so hopefully I'll be posting a recipe for them soon. Since going lc, I have tried baking a variety of things. Unfortunately, I was very successful until I made this last night. About 1:30am I decided to make these. At this time, I would be able to let them cool completely and have them for dessert. They were AWESOME. I used almond flour instead of hazelnut and left out the espresso (just because I didn't have it).Thanks for this delicious recipe. Hi I made with coconut flour 3 tablespoon and I used espresso powder from my coffee grinder ( I have a coffee shop). The customers loved it!! Thanks so much!!!! These turned out great! Love em! Thanks Lisa! So happy you enjoyed them.